LAS VEGAS—I say Epson, you say printers. I say Epson, you say projectors. Sure, the company is probably best known for rather prosaic office appliances, but now Epson is doubling down on its expertise in sensor technology and chip design to make a bigger statement in the wearables market. At the Consumer Electronics Show on Monday, Epson revealed two new wrist-worn activity trackers called Pulsense. 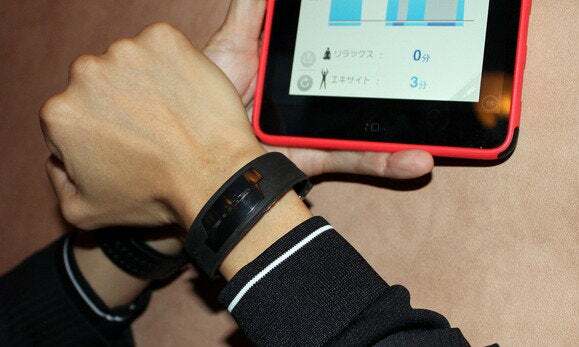 Leveraging Epson’s own proprietary sensor that “records a single heart beat as blood vessels contract,” the Pulsense bands can determine how quickly your ticker is tocking, and pair that data with accelerometer information to reveal a suite of statistics on your activity levels. It’s a system similar to what we find in the Basis B1 band, but Epson’s Pulsense bands also include 480 hours of onboard storage, thus precluding the need to frequently sync your wearable with a smartphone or computer to view data trends over time. Even better, the Pulsense bands don’t require smartphone pairing to work—so you can leave your phone at home when it’s time for the morning jog. The more simple Pulsense band holds 20 days worth of data, which you can view on a mobile app. The Pulsense PS-100 is a simple band that will retail for $130 when it ships this summer. It lacks a full data display, but includes LED indicators to help with heart rate targets during zone training. For a simple band lacking a watch face and detailed data, I found its size a bit large, and can’t see wearing it next to my wristwatch—but then again I’m in a dwindling group of world citizens who still wear a timepiece on their wrist. There’s also the $200 Pulsense PS-500, which is also slated for a summer release. It’s got a full time and date display, and can reveal real-time stats on heart rate, steps, and calories burned. And of course, the band can store those stats—about 20 days worth of data. 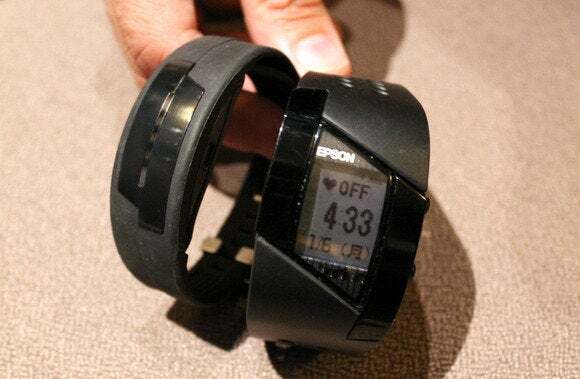 The PS-500 will be a direct competitor to the Basis band, and I'm interested to see if Epson’s heart rate accuracy holds up to what Basis offers. Epson also demonstrated the second generation of its Moverio augmented-reality smart glasses. Dubbed BT-200, the new glasses are thinner and lighter than the previous-generation Moverio model, and offer a fully transparent display, which I found makes for a much less disorienting visual experience than the Oculus Rift. Of course, the two headsets have different applications, but during a back-stage demo before Epson’s press conference, I appreciated the sheer sense of control the BT-200s offered. Epson showed me an augmented reality game in which you pursue and lock down on enemy spaceships simply by tracking them with your eyes. Sure, it was cool, but I find the glasses’ industrial applications more compelling. One scenario would involve using the glasses in a warehouse stacked with QR-coded boxes: Simply by glancing at a box and tripping the code, you could determine the contents of what’s inside. Using an LCD projection system, the BT-200s offer a binocular, full-screen experience, so you don’t have to peer into a postage-stamp size display at the top of your vision, as you do with Google Glass. 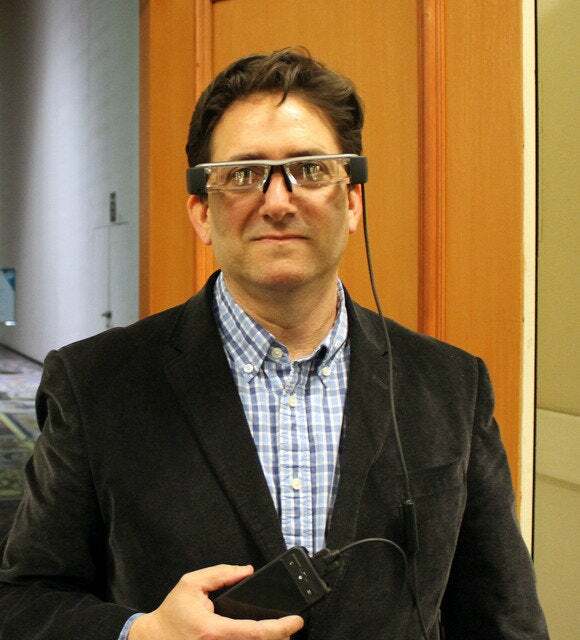 During my demo, I found this approach to be relatively comfortable, and less jarring than my experiences with Google’s infamous smartglasses. Reality blends with augmented reality relatively seamlessly, though you’ll still have to suffer the indignity of wearing goofy-looking cyborgware on your face. Backstage at the Epson press conference, full Moveriofied. Epson’s transparent display boasts a 960-by-540 resolution, and pairs with a gyroscope, compass and accelerometer for head-motion tracking. There’s also a front-facing camera, and Wi-Fi connectivity so you can viewing streaming video. The glasses boast native MP4 support; Bluetooth 3.0 for connecting to headsets, speakers and keyboards; and a MicroSDHC slot for 32GB of external storage. That said, the BT-200s do tell us something about what works and what doesn’t in smart glasses. The full-screen, transparent design isn’t completely disorienting, and that’s saying something. And it’s almost something of a moral victor considering all the obstacles smartglasses have to surmount. 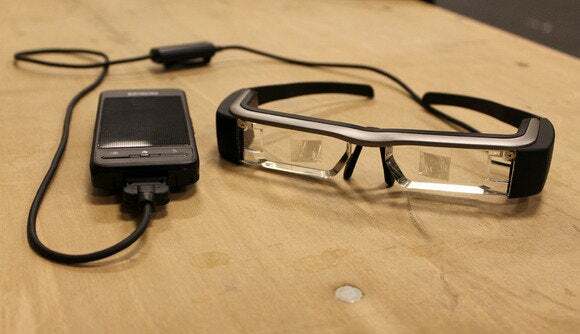 This story, "Epson embraces wearables with new Pulsense wrist bands, updated smart glasses" was originally published by TechHive.